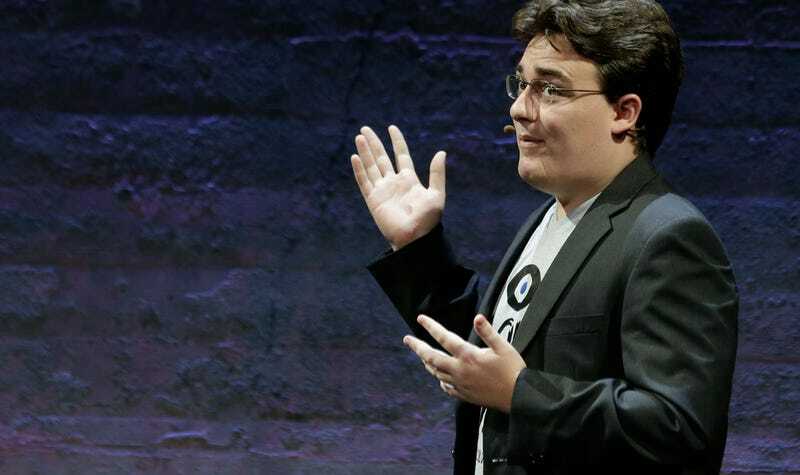 Palmer Luckey, the founder of Oculus Rift, has been keeping busy since he sold the company to Facebook in 2014. One thing he’s done to pass the time, as reported by The Daily Beast, is to financially back (and be named Vice President of) a non-profit dedicated to alt-right meme shitposts. UPDATE - 9/23, 10:30 PM: Palmer Luckey posted a statement to Facebook in which he claimed he’s not a Trump supporter and instead plans to vote Libertarian. He said he contributed $10,000 to Nimble America because he’s “committed to the principles of fair play and equal treatment” and “thought the organization had fresh ideas on how to communicate with young voters through the use of several billboards.” He also said he did not write the infamous ‘NimbleRichMan’ Reddit post, contrary to what the Daily Beast’s news editor claims Luckey said in an email. UPDATE - 5/18, 7:50pm: Corrected description of Nimble America from “company” to “non-profit.” Apologies for the error. Some actions Nimble America claim to have taken in recent months include “conquering Reddit” (and by that they mean r/The_Donald) and paying for a giant anti-Hillary Clinton billboard outside Pittsburgh. Alongside Luckey’s name (well, his Reddit account) on the group’s founders page are two mods of r/The_Donald. The report also dwells on the relationship between Luckey and Breitbart’s Milo Yiannopoulos, and mentions that another of Nimble America’s founders, Dustin Ward, claims the group will be paying for more billboards around the sites of upcoming presidential debates. NimbleRichMan is a near Billionaire and staunch supporter of the Common Sense Conservative movement. He is co-founder along with D.B. Purple and our third silent partner. Milo Yiannopoulos has personally vetted NimbleRichMan and the Non-Profit Nimble America, Inc. he helped create. NimbleRichMan will continue to guide Nimble America as its Vice-President. The American Revolution was funded by wealthy individuals. The same has been true of many movements for freedom in history. You can’t fight the American elite without serious firepower. They will outspend you and destroy you by any and all means. Now go read The Daily Beast’s full piece. UPDATE 2: Looks like Luckey’s NimbleRichMan Reddit account has been deleted.